The Crystal Silence League is the prayer network of the Association of Independent Spiritual Churches, "The Small Church Denomination." Our churches follow the principles and practices of the Spiritualist Tradition. We are called "The Small Church Denomination" because many of the buildings associated with our churches and chapels are very small in scale. 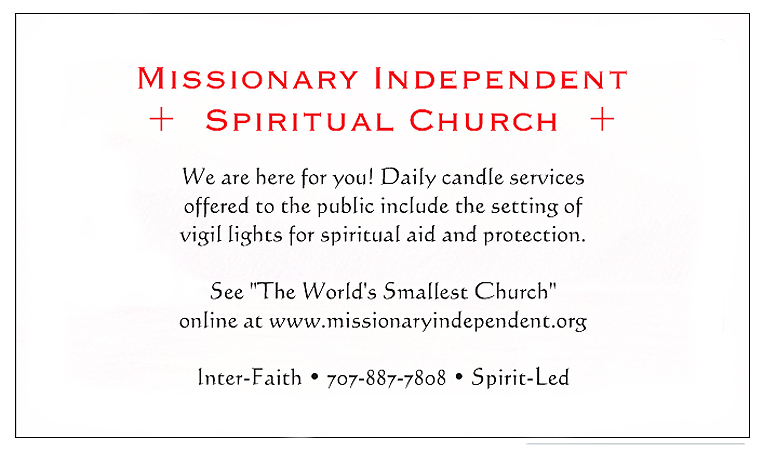 Indeed, our "Mother Church" is officially known as "The Smallest Church in the World." Forestville, California ("The Mother Church"). Pastor: Rev. catherine yronwode. Dallas, Texas. Pastor: Rev. Valentina Burton. Santa Rosa, California. Pastor: Rev. Sister Robin Petersen. Los Angeles, California. Pastor: Rev. Dr. E. Ekun Dayo Oni Shango. Orange County, California. Pastor: ConjureMan Ali Tata Alufa. Walnut Creek, California. Pastors: Chas Bogan, and Storm Faerywolf.